Addicted teenagers can get help from long-term therapeutic boarding schools that work with addicts and alcoholics – therapeutic boys ranches and alternative boarding schools. Therapeutic Boarding Schools » Articles » Uncategorized » Does Your Addicted Teen Need a Rehab, or a Special Boarding School? When you’re trying to find the best help for your teenager, you need to be armed with all the facts. Rehabs and boarding schools are both types of programs which address the issues of addiction and substance abuse, but they are very different. Traditional rehabilitation facilities are typically short, between 30-90 days in length, and focus entirely on treating addiction. Most of them are also medical model, meaning they emphasize getting their clients clean and sober, providing them with a few simple tools, and then directing them to further help after they leave the program. Boarding schools are much longer, usually about a year long, and provide a more holistic approach which includes therapy, academics, and extracurricular activities. For this discussion, it is important to note that not all therapeutic boarding schools offer help for teens struggling with substance abuse. In this article, we will be comparing rehabs with boarding schools which do offer such services. Addiction is a very complicated illness. It can be difficult to define, diagnose, and treatment can vary dramatically between programs. When your teenager began experimenting with drugs or alcohol, there are a few reasons why a traditional rehab might be less ideal than a boarding school which also works with substance abuse. 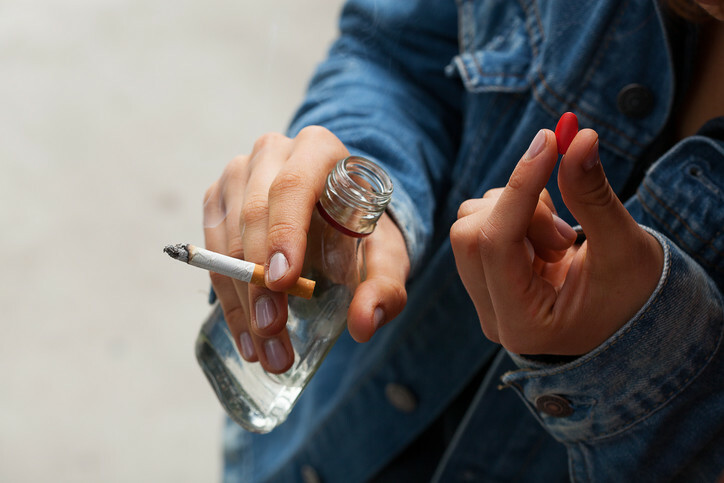 The first reason is that many teenagers who have gotten into drugs are not necessarily lifetime addicts and alcoholics in the way that clients at rehabs are. In a lot of cases, frightening though the drug problem might be, substances are just a tool that teenagers are using to cope with stresses in their life. These issues can be anything from lack of attention at home to social pressures or traumatic events, including the loss of a loved one. In these cases, rehab facilities will not be effective, since they do not provide therapy or long-term behavioral change. Another important thing to know about addiction is that it is a progressive illness. For addicted adults, the disease has likely been a long time progressing and rehab facilities are absolutely the best, if not the only, solution. However, if your son or daughter is in their teens, there is a good chance that the illness has not progressed to this state yet. In cases where addiction is caught early, the therapy offered by boarding schools is often enough to reverse the progress of addiction and give kids a chance to start over before the addiction has fully taken hold. When an adult begins to face the consequences of his long-term addiction or alcoholism, the damage becomes so severe that it is literally the only thing that matters, in a clinical sense. The addicted adult needs to address this problem immediately; it has become a matter of life and death. For teenagers struggling with addiction, however, a more comprehensive, long-term approach needs to be taken. For example, your son or daughter is still in high school, possibly hoping to attend a university. By placing such a teenager in a rehab, they will have to be taken out of school. This will cause them to fall even further behind in their schoolwork, create a feeling of isolation from their peers, and could have a damaging impact on their future. In addition, these issues will add stress to a teenager who is already suffering, and could very easily lead to an immediate relapse after time spent in a rehab. Therapeutic boarding schools which deal with addiction address these issues. Teens will not be separated from other children their age. Instead, they will be provided with a healthy support system of teenagers who are going through similar issues. Instead of being taken out of school, they will be provided with academics that can fit around their therapy and addiction treatment. The aim of these programs is to lower the stress in these teenager’s lives, in general, and also provide them with healthy tools to deal with any stress that they do have. If your teenager is struggling with addiction, their best hope is a long-term therapeutic boarding school which works with addicted teens. Most teenagers will not benefit from being in a short-term rehab with older, long-term addicts and alcoholics. They will find themselves unable to relate to these people, they will miss out on vital components of their teenage years (like education and healthy peer interaction), and, in many cases, will emerge much the same, if not worse. Rehabs are extremely important facilities which provide invaluable services to the ever-growing community of addicts and alcoholics in this country. However, your teenager needs a program which suits their needs specifically. Addiction is a progressive illness, getting early treatment is absolutely essential! Should you need help finding therapeutic schools, boarding high schools, troubled teens schools or boarding schools, please let us know. The best therapeutic programs and schools provide treatment for troubled teens. This site includes a list of best therapeutic boarding schools, best residential treatment programs for teens, best wilderness programs, outdoor therapeutic and adventure therapy programs, and programs working with troubled teens. Boarding Schools, Emotional Growth Schools and Therapeutic Boarding Schools provide supervision and counseling for at-risk teenage boys and girls. Residential Treatment Centers offer clinical treatment with both academic and behavioral support, plus medication management and medical monitoring. They treat adolescents with serious psychological and behavior issues, are highly structured, and they offer recreational and adventure activities for troubled teens. If you are searching for troubled youth homes, troubled teen schools or troubled teen boarding schools, you have found a list of them. Homes for troubled teens and boarding schools for teens don’t typically offer teen counseling and therapy, but these programs do. Among the top therapeutic schools, our list of therapeutic boarding schools shows the best therapeutic schools with counseling – also referred to as “schools for troubled teens”. Some troubled teen schools, residential treatment programs for teens and residential treatment centers can be affordable. These boarding schools can help your teenager who is defiant, breaking laws, or otherwise having bad behavior.